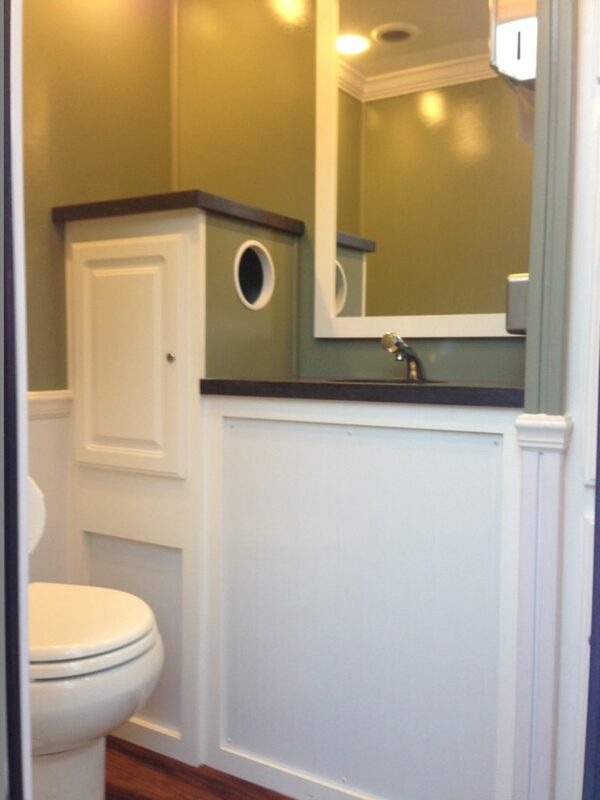 As guests enter this private, 2-Station restroom trailer they are struck by the warm, comfortable surroundings. The soft music and clean, well-lit interior provides a pleasant atmosphere where they can escape from the crowd and enjoy a few moments alone. Some key features are; wood grain flooring, LED lighting, Corian counter tops, stainless steel sinks and commercial grade metered faucets. This unit features a men’s and women’s restroom that come fully equipped with foot pedal flush toilets, wood grain flooring, distinctive wainscoting, crown molding, a central stereo system and AC/Heat. Each suite also includes LED lighting, Corian counter tops, stainless steel sinks and commercial grade metered faucets. Integrated paper trash holes allow waste cans to be placed out of sight under the cabinets for a neat interior appearance.